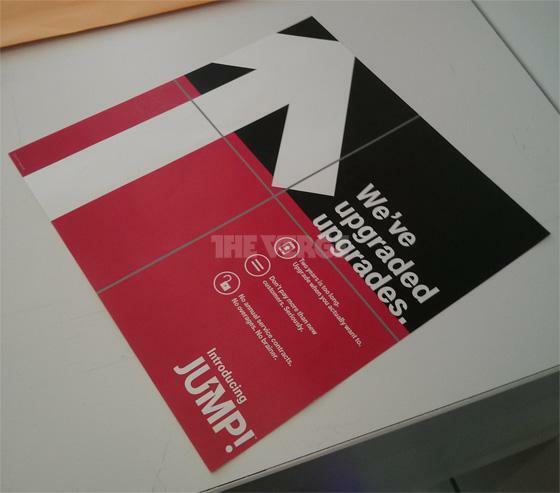 In a move that confirms our intel that T-Mobile “upgrade upgrades” at their media event taking place later this afternoon, The Verge has confirmed that intel via a newly leaked image. An earlier report by CNET had suggested that T-Mobile might want a monthly fee or a survey that went out to customers suggesting the company would consider requiring customers to trade-in their existing handsets. Ultimately any such program would allow existing customers to upgrade at new customer pricing anytime they upgrade. Still, we don’t know all the information that will surround T-Mobile’s “upgraded upgrade” process but given that the event is just over two hours away, we’ll know everything soon enough. Of course all of this is substantiated by T-Mobile’s own advertisement which ran over the weekend suggesting the company was preparing to fire a shot across the AT&T bow in respect to upgrades. I would still expect to hear a major LTE announcement today as well. As for what else T-Mobile could have in store, that’s anyones guess! if you go to t-mobile.com/jump you get redirected to a blank page instead of a 404. Edit……annnnd they must stalk the comment section here because they took it down. Gotta hand it to T-Mo and the CEO … they are certainly implementing new sales practices that has been operating the same way in the US for a couple of decades. I wish them luck with this new upgrade club! But are they explaining it clearly enough to the casual phone user? This is awesome, great job T-Mo! Please don’t let this be all they announce today… I mean it’s great for those that like to light $100 bills on fire just to have the latest and greatest every 6 months, and enjoy dealing with car salesman getting them into vehicle leases, or rent-to-own appliances for people with no financial comprehension. For the majority of people who choose TMobile over AT&T and Verizon though, it’s almost purely price driven. The whole point of this is to make it easier and more affordable for people to upgrade. A small monthly fee with a really low out of pocket payment with trade in. This is price driven. I would like for there to be more, they could announce the launch of more LTE markets and what not. But his would be a good deal for a lot of people. Myself included. Perhaps it will work out for a few people. Not enough to warrant a press conference for though. I suspect the JUMP monthly fee + likely mandatory insurance + EIP works out to something financially distasteful to the majority of TMobile customers though. Let’s not judge or be negative until all the facts are in. I doubt T-Mobile would go through the trouble of a press conference if it wasn’t something “a few people” were interested in. An insurance plan by any other name is still insurance. The monthly fee may not be as bad as it could have been, but you are still paying $10 per month PLUS the EIP of $20-$25 (let’s face it this will only appeal to those wanting the highest end devices), AND a likely deductible. Pass. 2. Will upgrade every 6 months. If not, you’ve effectively added $120 to the cost of your phone. This just makes me want to stay with Magenta! I’m pumped! Can’t wait to read all the details!! My grandfathered plans are slightly cheaper than simple choice but I would consider giving them up to take advantage of something like this. Good move UNcarrier! I can upgrade anytime coz I pay full price on the phone : LOL!!! Was just searching for that. Don’t think it will be streamed anywhere. This one works, T-Mo banner up at the moment and says webcast will begin at 2:30pm est. Being a new T-Mobile fan, I’m interested to see what they plan on announcing. I dont think you represent a majority view of most Tmobile customers. Maybe its more of a desire for Android skinned users who get stuck in old OS versions. I just think of all the Gingerbread people who signed 2 year contracts in 2011 who were stuck or maybe still are stuck with that OS until their contracts end. 1 million % agree. Thats all i want. A new phone every year 9but every 6m would be better) and pay $200 a pop. i would even trade in my phone without a problem! To be honest I smell smoke and see mirrors. Got to lay-off the meds. Can’t wait to get details on this club. C’mon announcement for LTE in Pensacola-Mobile area. yeah…. and they are the ONLY ones on this cycle. Good timing. As new smartphones are coming to market from Apple, LG, Nokia, etc.. I’m betting they are going to try and leverage the new smartphone hype thats coming to gain new customers and to keep old customers happy. MetroPCS customers are known for upgrading often.. This might be a move to help keep them happy too. What time is this happening? any live coverage ? everyone who has heard of table rock lake in mo please upvote. no one? no? that’s why, buddy. LTE is almost completely turned on in Metro Detroit and San Fransisco among other cities, there’s no way they’re not announcing a broad new LTE rollout today. I just tried to go to the T-Mobile website, and it is not working right. It seems to be down? They haven’t even announced what it is they are doing and the website is down????? The redirect is there. Guessing the website wont go live until the announcement today. Maybe a program to bump us to LTE phones might be a small plus. I love T-Mobile’s value but I kind of have to agree. 40 minutes – 1 hour outside of any major metropolitan area = 2G towers. Yeah I am EDGE here to my friend. wait… didn’t T-Mobile hire Xzibit for a commercial spot? Yo dawg… We heard you like new phones so we upgraded yo upgrade so you can upgrade while you upgrade! I would just like to know what the overall pricing would be. Like a detailed explanation. It wouldn’t make no sense for me to pay off my phone, then upgrade to a new one, pay $10 a month for the 2 upgrades a year, trade in my phone, but still have to pay $20 a month to pay it off. Something has to be a bit cheaper, or what’s the benefit? By how I understood, if you are at 18 months, then there is no reason to pay, you just upgrade. When you upgrade, then you enroll that phone. After 6 months and paying $60.00 in JUMP fees, you decide you don’t want that phone, you bring it in, they wipe out the remaining EIP, you pay the down payment on the new phone, and the rest in EIP. If it is damaged, then the insurance will kick in, you pay the deductible, and still get a new phone. As well say you are only 6 months into your current (no)contract, you pay 6 months in JUMP fees, then you can upgrade at 12 months into your (no)contract. But regardless you have to be in the JUMP for 6 months.